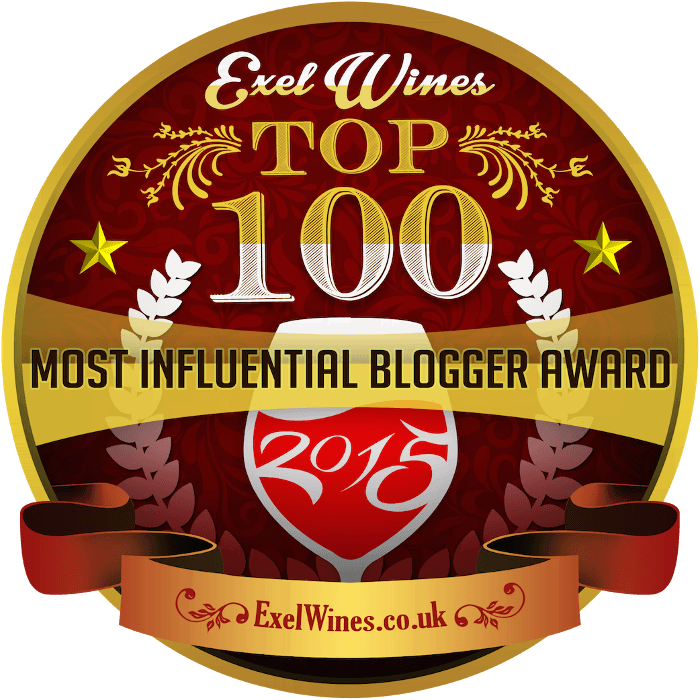 At a recent tasting of Greek wines, I had expected the bottlings from Santorini to be some of the biggest stars. I’ve long loved the sunny whites from this volcanic Aegean Island, where most vines are trained into unusual basket shapes to protect them from the wind. Accompanied by Liz Barrett, who cohosts Name That Wine with me, I made a beeline for the Santorini table. Indeed, I quite liked some of the Santorini wines — I’m always up for a good Assyrtiko, which often has ripe fruit, brightly lemony acids and a minerally finish. 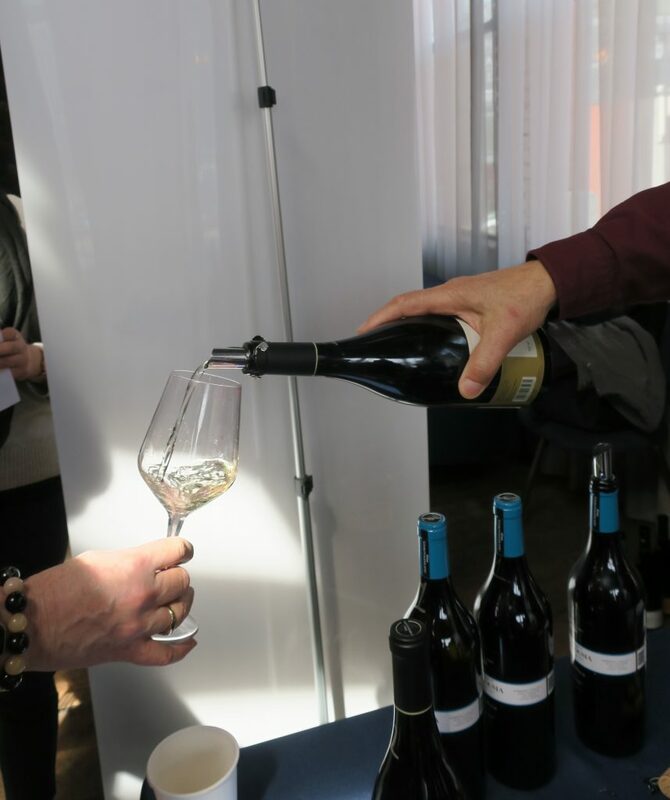 But the biggest surprise came at a table on the opposite side of the room, where winemaker Evangelos Gerovassiliou was pouring. Gerovassiliou’s winery stands near the coast south of Thessaloniki, in the north of mainland Greece. My World Atlas of Wine considers this general region to be “red wine country,” but Gerovassiliou is famous for rescuing what is now one of Greece’s best-known white grape varieties: Malagousia. 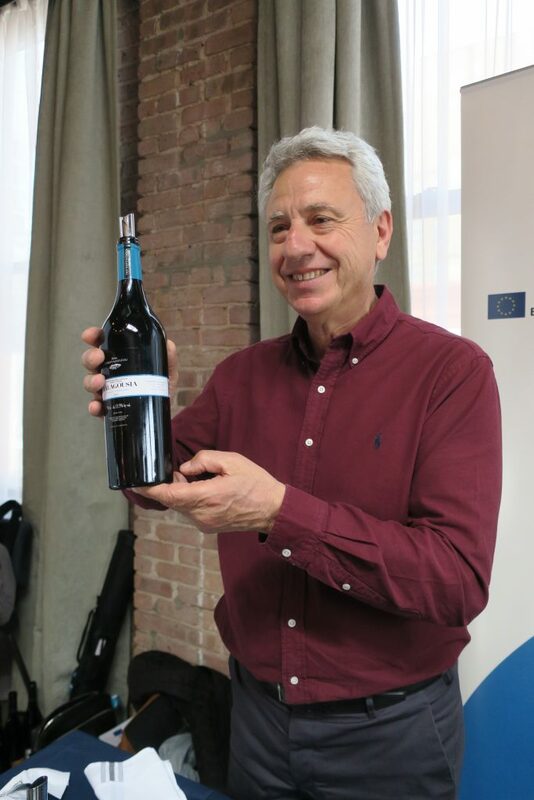 As he poured us tastes of his 2016 Single-Vineyard Malagousia, he told us how in the 1970s, he had been working with a University of Thessaloniki ampelographer, Professor Vassilis Logothetis. Logothetis found some Malagousia vines, planted them in his experimental vineyard and showed them to Gerovassiliou, who was working at a nearby winery as an oenologist. 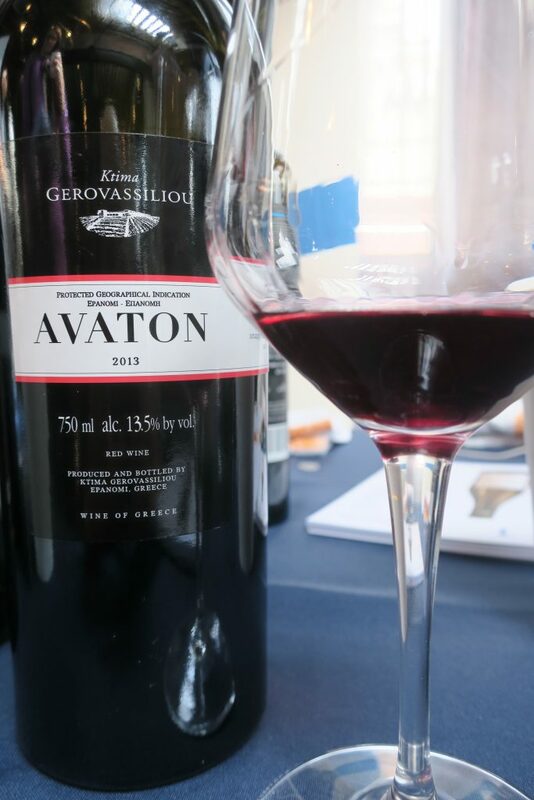 Gerovassiliou recognized the vines’ potential, and his success with the nearly extinct grape drew the attention of other winemakers. 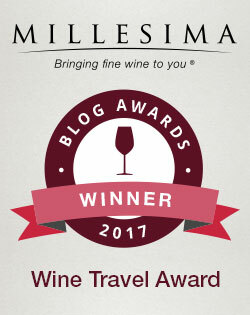 Now numerous wineries in Greece work with Malagousia, which “yields full-bodied, perfumed wines in many Greek regions,” according to The Oxford Companion to Wine. Gerovassiliou’s Malagousia certainly fit that description, with notes of ripe stone fruit, honey, orange flower and mango in the aroma. Yet it tasted spicy, clean and fresh, enhanced by zesty acids. A delight. Too often in wine shops, Greek wines are shunted off in a corner along with various Eastern European oddities (and many of those deserve better as well). Yet Greece’s winemaking traditions go back thousands of years, and contemporary winemakers are making world-class wines that any sommelier should be proud to pour. Ask your wineshop for a recommendation. And if you happen to find a bottle by Ktima Gerovassiliou, don’t hesitate to snap it up. Anything by that winery is sure to be a pleasure. I’ve been having a lot of luck with Greek wines lately, so it was with no hesitation that I accepted free samples of two “Sofos” blends from the Peloponnese Peninsula. These wines, produced by Domaine Gioulis, intrigued me for two reasons besides their Greek origin. 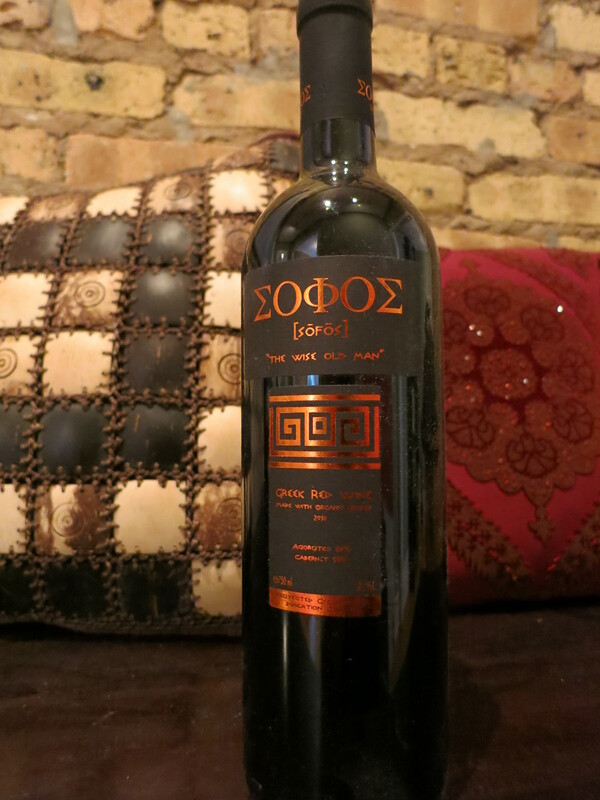 They each blend an indigenous Greek variety with a well-known international grape, and they are each organic. In fact, the vineyards which produced these wines are the first in Greece to be “Non-GMO Project Verified.” I’m not convinced that GMOs (genetically modified organisms) are especially widespread in the wine industry — The Oxford Companion to Wine notes that there have been field trials, but “consumer resistance in parts of Europe has been considerable,” and it’s not even clear if genetically modified vines can legally retain their varietal name. Nevertheless, if you wish to be 100% sure that you’re avoiding anything produced from GMOs, these wines are for you. Both come from the Klimenti region, a “Protected Geographical Indication” (PGI) adjacent to Neméa, one of Greece’s very best wine regions. As The World Atlas of Wine explains, Neméa (and Klimenti too, according to a Sofos press release) has “milder winters and cooler summers than one might expect,” because of the influence of the Mediterranean and the high altitude, respectively. Sofos’ vineyards grow at 750 meters (about 2,500 feet), quite close to the highest zone of Neméa at 2,950 feet. At these altitudes, the vineyards produce “fine, elegant, almost “cool-climate reds,” according to the Atlas. Sofos (which means “wise old man”) makes its red wine from 50% Agiorgitiko, a variety indigenous to the Neméa region which “can yield long-lived reds” from grapes grown in higher vineyards, according to the Oxford Companion. The other half of the wine is Cabernet Sauvignon, a variety with which Agiorgitiko blends notably well, the Companion asserts. The high-altitude vineyards and ideal blending partners pay off in the bottle. Enticingly purple and opaque, the 2010 Sofos Red‘s fruit and minerality were evident at first sniff. “It’s that rocky, chalky stuff,” a tasting partner remarked, and another detected “an undertone of super-sweetness in the aroma.” I agreed, smelling chalk, vanilla and red berries in the nose. It started with surprising lightness on the palate, given the deep color, with bright red fruit that darkened and broadened into purple plums, followed by orangey acids and some beefy tannins. Paired with a sausage pizza, spicier notes came to the fore. Quite a value for about $12 a bottle. The pétillance [light sparkle] is due to the freshness of the wine. The white Sofos comes from the 2013 vintage that was bottled early, in October 2013. Thus there is a small percentage of bottles that could have appear pétillance in the border. The slight existence of CO2 -pétillance- in a fresh wine is something natural that unfortunately we cannot avoid it in 100%. In my bottle it was no mere pétillance — the bubbles were clearly evident in the glass, not just on the tongue. But this was not necessarily a bad thing — Chardonnay, of course, serves as the base of many top Champagnes, and I also recently tasted a delicious sparkling Moschofilero, one of my favorite Greek white varieties (you can read more about Moschofilero here). The Sofos white had aromas of ripe apples, tropical fruit and tart lime, but it tasted quite dry, with floral overtones and a lemony finish. The bubbles felt tight and fizzy, helping the wine cut through the richness of some barley risotto with asparagus, peas, mushrooms and Parmesan. And the risotto enhanced the wine as well, making it feel rounder and deeper. Another excellent value for $12 a bottle. I’ve said it before, I’ll say it now, and doubtless I’ll say it again: There’s something exciting happening in Greece. Many people still regard Greece as a second-rate wine producer — read about the reaction of a Binny’s Beverage Depot sales clerk here — but those days are in the past. These Sofos wines provide yet more evidence that Greece is making delicious, fascinating and food-friendly wines. Most, like Sofos, are priced very affordably. Greek wine hasn’t been this good since the days of Pericles, and it’s only getting better. Now that spring has arrived, or so I’ve heard, I would ordinarily start turning my eye to the section of my wine rack containing richer whites, like Chardonnay or Riesling. But the ceaseless whirling of polar vortices continues to mar this so-called spring, and I’m not ready to turn away from hearty reds just yet. 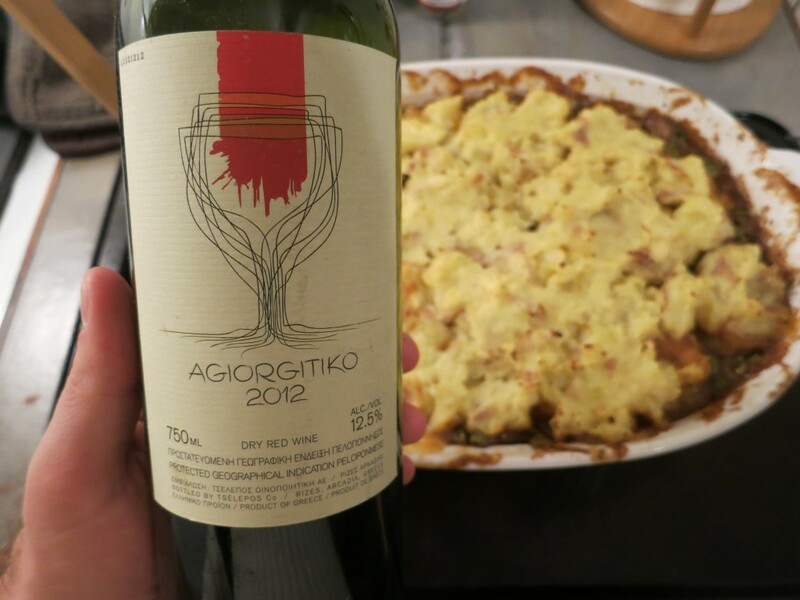 Facing yet another day of temperatures measuring 20 degrees below normal, I fixed up a comforting beef-and-bison shepherd’s pie and opened some Agiorgitiko to go with it. Greek Agiorgitiko is not a classic pairing for shepherd’s pie, but it should be. This hard-to-pronounce variety (ah-your-YEE-tee-koh is my best approximation) produces ever-more delicious red wines in Greece’s Peloponnese Peninsula. According to The World Atlas of Wine, the northern half of the peninsula “has seen even more energy and activity than any other part of Greece in recent years,” and Agiorgitiko is one of the region’s signature grapes. Fortunately, the 2012 Tselepos Agiorgitiko lacked neither acid nor fruit, despite its rather general “Arcadia” appellation (Arcadian grapes can be grown anywhere in the central Peloponnese, in either choice high-altitude vineyards or less-desirable plains). It smelled of raspberry jam and vanilla, and it had plenty of red fruit flavor, matched by prominent, rustic acids. But it’s a dry wine, with some tannins on the finish along with a note of earth. 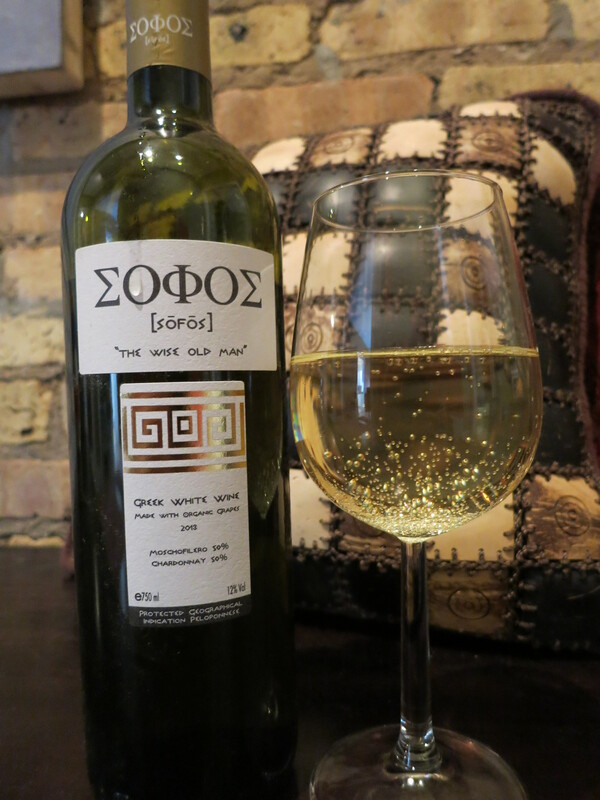 Casual and fun, the Tselepos Agiorgitiko would make a fine party wine, surely pairing well with a range of foods. It certainly matched the rich shepherd’s pie well; the acids smoothed out and the tannins were just stout enough to clear my palate for the next bite. And at $11.50, the price I paid for the bottle at In Fine Spirits, it won’t break the bank to serve a few bottles to your guests. Though this isn’t a wine to serve for a special occasion, at that price, it doesn’t have to be. It looks like we’ve got more frigid “spring” evenings yet to come, and goodness knows we’ll need help getting through them. The flavorful Tselepos Agiorgitiko provides a lot of comfort for the money. 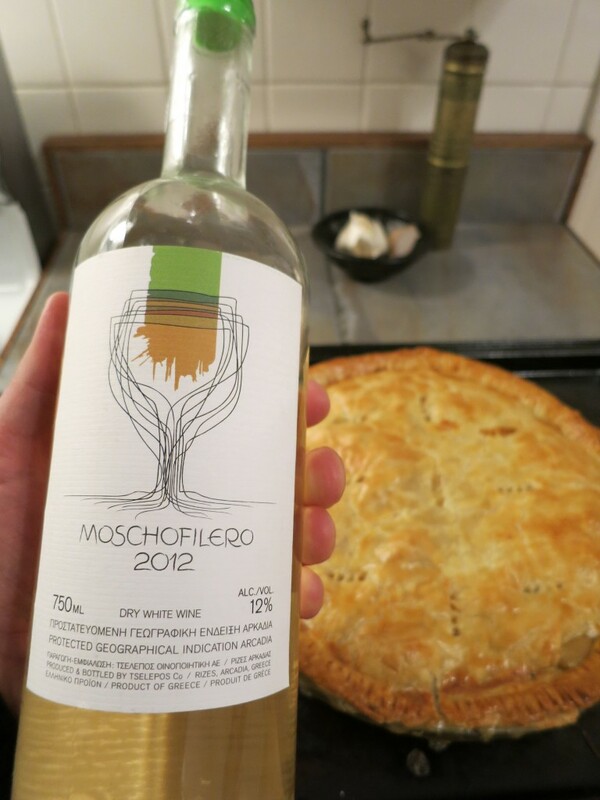 I’ve written before about Greek Moschofilero (also spelled Moscophilero), a white wine which I’ve found both exceedingly charming and slightly off-putting. The origins of this pink-skinned grape variety are “as yet obscure,” according to The Oxford Companion to Wine, and goodness knows I love a mysterious grape variety. Moschofilero also happens to usually taste rather floral and fruity, which made it ideal to pour with the season premier of Downton Abbey. Not so much because of the show, but because one of our guests preferred sweeter whites, and because I thought it would pair well with the chicken pot pie in the oven. Why open a Moschofilero instead of a Riesling or a Gewürztraminer? For shock value, of course, and because you tend to get a lot of bang for your buck. The 2012 Tselepos Moschofilero cost me just $10 at Binny’s, and really, you’ll be hard pressed to find a well-balanced Riesling at that price. According to the label, this particular Moschofilero is a “Protected Geographical Indication Arcadia,” which basically means the fruit for the wine could come from anywhere in that central Peloponnese province. Arcadia doesn’t qualify as an appellation, however. That distinction belongs to Mantinia, a high-altitude plateau in Arcadia, which produces wines that can command higher prices (see the Tselepos Mantinia, which costs about $5 more at Binny’s than the Tselepos Arcadia). Beyond that, the wine is a bit of a mystery. The minimalist importer’s website shines little light upon it, and the Tselepos website doesn’t list the Arcadian Moschofilero among its bottlings. But in any case, at $10, this Moschofilero isn’t much of a risk. A pale, pinkish yellow, this wine had a heady, sweet aroma of ripe apples, jasmine and incense. It tasted drier than I thought it would, with a bit of a prickly texture, flavors of apples and flowers, and some exotic spice underneath. The fruit was a bit flabby, to be sure, but the wine pulled together some with the pot pie. I wished it had more of a backbone, but hey, for $10, it’s quite an interesting and flavorful wine. Would I buy it again? I would probably go for the more expensive Mantinia version if I could find it, or if I did want to only spend $10, I would buy the Kyklos Moschofilero instead.